1 cup strawberries sliced into thin ¼ inch thick slices. ½ cup fresh Blue Berries. 4 Cups Banana Low Fat Yogurt. 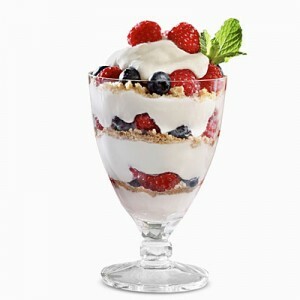 With Spring comes warm days and picnics – and a perfect treat that kids will love is a Spring Berry Fruit Parfait. This is one of our favorite frozen treat picnic recipes from the Picnic Source.com. Picnics are one of the best ways to spend time with family – and one of the only ways that can trump the distractions of everyday life ( including cell phones, Facebook and video games ). For those with a bit of romance in them – a picnic is a hard to top first date – and with a little planning can make a great memory and first impression. Although it is easy to plan a picnic with commercially produced foods – there is just something special about preparing the eats yourself. Maybe it’s that we rarely get to eat country fresh meals anymore – or it’s just that things taste better outside – and berries are one of those things that just go hand in hand with a picnic on a clean, warm Spring afternoon. With that said, this ultra-simple dessert treat is filled with sliced strawberries, raspberries and blue berries, crushed peanuts and a dash of brown sugar. The banana yogurt brings out the flavor of the fruit, and is a Spring picnic treat that will be a sure hit with kids and adults – even those that aren’t crazy about yogurt. The use of low fat / zero fat Banana yogurt mixed in with the fresh berries is equal to any high calorie ice cream cone for flavor and taste – but without the calories despite the use of brown sugar. In freezable disposable cup – put one ½ cup of yogurt on top of a layer of peanuts at the bottom of each cup. In a medium bowl take the remaining yogurt and gently mix in the berries being sure not to crush or damage the delicate blue berries or raspberries. Distribute the mix evenly among the four cups. Sprinkle a layer of brown sugar and crushed peanuts on top of mixture in cup. Put in freezer for three hours or until coming close to hardening. If you use slurpee cups or a similar container these wonderful Spring treats can be easily transported and will stay fresh for several hours during a picnic on a warm Spring day if kept in a chill bag or cooler. An optional way to make these is to layer them with yogurt / fruit / yogurt etc.